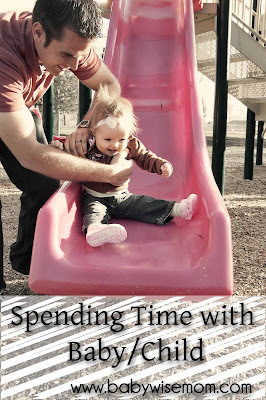 How Much Time Should You Spend With Your Child Daily. How to know if you are spending too much time with your child or too little time with your child. Mom guilt is real. You can easily find a way to feel guilty about any facet of parenting. One major category with potential for guilt is time spent with your baby or child. You don’t need to spend every minute with your child. You don’t need to focus on your child at all times. Of course you should focus at times. How do you know how much time should be spent focusing on your child? How do you know if you are spending too much time focusing there? How do you know if it is too little? On Becoming Baby Wise, Book Two (affiliate) says, “It’s important to enjoy your relationship with your pretoddler, but you must find the right balance between playing with your child and becoming your child’s sole source of entertainment” (page 77). It also goes on to say there is no right amount of time that must be devoted to family time activities. This is a question that does not have an easy answer. There is no “65 minutes a day” answer. It is really going to depend on your child’s personality (is anyone sick of that answer yet :). There are some guidelines that can help you know what is best for your child. Let’s discuss. Your child clings to you. This would be under a healthy, non-pain situation. Kaitlyn (15 montsh old) will sometimes cling to me, but only when she isn’t feeling well OR she just needs a hug. Kaitlyn is a toddler (I want to say baby but I guess she is a toddler now) who has physical touch as either her main love language or really high up there. She also has a mother who has physical touch as her lowest love language. If I haven’t shown her enough physical affection, she lets me know it. All I have to do is pick her up, hug her, kiss her, cuddle her, and she is off and playing again. Brayden has never been one to cling to me. Your child refuses to go to dad or siblings. I have found this with Kaitlyn, also. It is so hard to do when you have more than one child. Dad comes home and he takes care of the older child(ren) while mom takes care of the baby. Then baby only wants mom. I have written a post on this: Non-BW Tips and Tricks: Teamwork. Some kids are more prone to this than others. I know Brayden was always thrilled to have a change of caregiver–he still is. Kaitlyn has gotten much better. She has her people she is happy to go see. When Daddy gets home, she wants to see him for a minute, but she usually is soon desiring to be back with Mom. If Kaitlyn is around people she doesn’t know, she wants mom. Your child cries when you leave the room. This can often be mistaken for separation anxiety. If your suspect separation anxiety, evaluate the amount of time you are spending with your child. I will also add that your child won’t play with a toy unless you are playing also. I think this is more common among the oldest children. I think this is a possible problem. I know the mom who asked me this question originally was struggling to know if she was spending too much or too little time. I have found this to be easy to do if you have an older child who is great at self-entertaining and a younger child who requires a lot of time and attention. 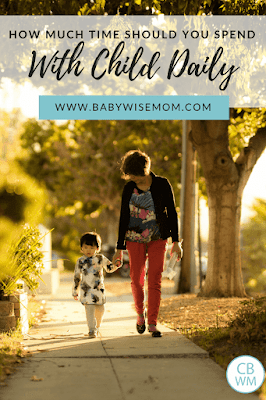 This topic isn’t discussed in Babywise, but here are some of my thoughts. Your child seems sad or lonely. This is a great hint. I think this problem is most likely to happen if there is more than one child in the house, and more likely to happen to the older, more independent children. Your child might start being disobedient. This would be in effort to get your attention. Your child gets into mischief. This would be a problem with not enough direction from the parent to keep him busy with good things. Your gut tells you. Always listen to your intuition. This is a list from page 78 in Babywise II. Reading. I love reading. Read with your child daily. You can take turns with your spouse. Bathing. You are obviously going to pay attention to your children while bathing them. Walking. Go for walks or bike rides. Touching. Cuddling, tickling, wrestling, etc. It can be hard to find the correct balance between too much and not enough time. It shouldn’t be too hard if you give it some thought, though. Consider your schedule. There are many things that are already set aside as time alone and time with family members. Bouncy seat, swing, jumperoo, gym, etc. for the younger babies. Naps/bedtime. This isn’t time to play, but it is time your child is alone. Structured Playtime (for toddlers). Also, no post, but there will be. Remember that “others” should vary. It shouldn’t always be mom, dad, or brother. Singing/massaging/etc. for younger babies (and older ones if they like it). Clean-up after playtime. Brayden (3) sometimes cleans up all on his own. I have just started to instruct him to clean up certain toys before I start to help. But most days he still gets a lot of help from me. I find it very valuable to have some special, one-on-one time with your child each day. I would encourage you to play with your child each day in a situation where you are spending time just enjoying your child. Don’t make all your time spent together all about getting things done. For example, Brayden will spend a lot of time with my husband and me helping around the house. That is wonderful and I am happy for him to learn how to work. However, we have also made the determination that we need to have special, one-on-one time with him each day where we are just playing with him. For Brayden and I, this often comes in the form of his learning time. For Daddy, that can include playing trucks, playing in the sandbox, etc. It doesn’t have to be long, but while you are doing it, put your attention on your child. Show them you love them and praise them for the good things you do. You can read to your child, cuddle with your child, tickle, play games, play with toys, dance, sing, etc. Do something where your task is to enjoy your child. We have also started a “date night” with our children. 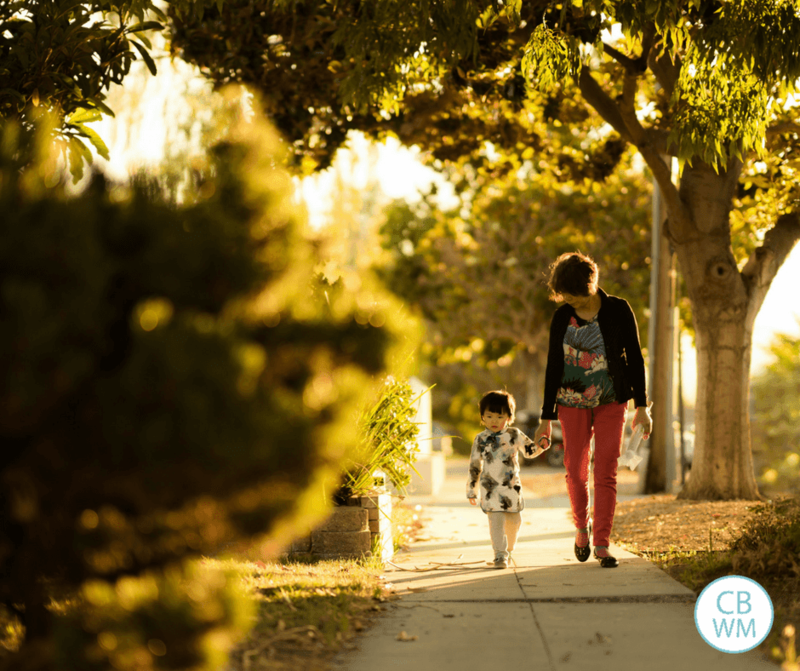 Once a month, each of us will have an evening where we are one-on-one with a child. Brayden and I had our first date night two weeks ago. It actually was in the day and Kaitlyn spent time at Grandma’s house. We went to a toy store and looked at toys and played with Thomas stuff. We then went and got ice cream together. He really had a lot of fun. Great post! Thanks for your insight on this subject as I have been thinking about this too. Thank you so much for this comment! I work so I struggle with this. Often when I get home there is so much to do, I feel like I’m not spending enough time with my LO. It helps to have a gauge and some idea of what other people are doing. Thank so much for your site! It’s a huge help. Next Post Poll Results: What was/is baby’s approximate optimal waketime length for ages 5-6 Months? (waketime length includes feeding time)? What suggestions do you have to help me deal with separation anxiety? My son just turned 6 months and all of the sudden he can’t be left alone to play. He’s fine at daycare when I leave and his caretaker doesn’t experience this – but there are also other babies there to entertain him (he only goes once a week. When he’s at home with me, I’ll give him some playpen time for example, and leave his sight. He’s good for a few minutes and then starts fussing. If he sees me then is full blown crying. If I’m out of sight for loner than 5 minutes, he’ll cry on and off. What can I do to get rid of this behavior? I can’t get anything done around the house unless he is sleeping or someone else is with him to keep him occupied! LEM, I don’t personally have experience with SA. I would suggest you try some books and/or websites you trust on the topic for ideas. From most of what I have read about it here and there, it is just something that you basically have to wait for them to get over if it is SA. Good luck! Hello! I am wondering if you have any advice for me. I have 8 month twin boys, who only recently have become clingy with me. If I'm playing with them and pick up one for hugs, the other will suddenly "need" me, and vice versa. If I've been playing with them and then get up to do something else, they sometimes cry as though they are heartbroken. It is especially rough at night while my husband and I are getting them ready for bed. Which ever one my husband is caring for will cry until I am finished with the other and am able to hold him. If we have a babysitter, then it is not a problem. Only if I'm around. I have been consistently giving them 20-30 minutes independent time in the morning and then sometimes another 15-20 minutes in the afternoons. I wonder if I need to start having one-on-one time with them each day.Do you have any suggestions? Much appreciated!